Councilmember Teresa Mosqueda (Position 8, Citywide) advanced the Domestic Workers’ Bill of Rights through her Housing, Health, Energy and Workers’ Rights Committee, legislation that requires domestic workers receive a minimum wage, rest and meal breaks and privacy protections. There are approximately 33,000 domestic workers in Seattle, according to a report by Seattle Domestic Workers Alliance, including nannies, house cleaners and home care workers, many of whom aren’t covered by basic labor protections. “I worked for a family as a nanny, that also asked me to care for their elderly father, as if I was a certified home care worker, and expected me to be a full-time cleaner during their vacation getaways. When I worked over 50 hours, they only submitted 40 hours worked, claiming I was salaried to avoid paying overtime. There are a lot of good employers out there, but this kind of thing shouldn’t happen to anyone in our field. It’s not allowed in other workforces, and it shouldn’t be allowed in ours,” said Michelle Manney, a Seattle domestic worker. The legislation ensures domestic workers receive proper rest and meal breaks, minimum wage, and are able to retain their personal documents and will apply to domestic workers regardless of classification. Protections for domestic workers will be implemented and enforced by the City’s Office of Labor Standards. “I’ve worked as a live-in nanny in Green Lake for years. With my current family, I have traveled all over the world and they have always treated me as a part of the family. But it’s also a job, and we need to set boundaries and separate feelings from work. 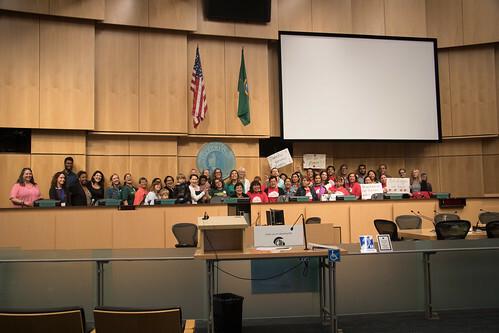 The Domestic Workers’ Bill of Rights will help make this happen by covering live-in workers and establishing a Standards Board where we can come together,” said Maria Flores, a Seattle nanny. The legislation also establishes a Domestic Workers Standards Board, made up of workers, employers, workers organizations, people who hire domestic workers and community members. The Board will recommend new labor standards such as retirement benefits, workers’ compensation and sick leave. The board will also be tasked with creating innovative mechanisms for implementing those standards, such as benefits that are portable among multiple employers. “Our clients support this legislation because they realize the trickle down benefits of creating standards. The beneficiaries of these protections are not just their employees, but their children. When workers feel valued and have the opportunity to access training and education, children will ultimately be the ones who are positively impacted,” said Emily Dills from the Seattle Nanny Network. Mosqueda’s legislation was crafted after organizing an extensive city-wide listening session tour earlier this year, which included hearing from domestic workers, employers, academics and community members, and helped to inform her work on the base legislation. The legislation will go before the full Council Monday, July 23 at 2 p.m.